The Howell-Oregon Electric Cooperative business office will be closed on Thursday, November 23rd, and Friday, November 24th, for the Thanksgiving holiday. As always, dispatchers will be available to serve members in the event of a power outage. The 2017 "Trunk or Treat" event was held October 25th at the West Plains Civic Center. Howell-Oregon Electric Cooperative participated along with other businesses and organizations, promoting a safe, family-friendly environment for area children to "trick or treat." Dan Singletary, CEO/General Manager of Howell-Oregon Electric Cooperative, West Plains, was recently appointed to the Executive and Internal Operations Committees for the Association of Missouri Electric Cooperatives (AMEC), Jefferson City. HOEC is participating in National Cyber Security Awareness Month (NCSAM) this October to help raise awareness about cyber threats and ways to stay secure. Eight linemen from HOEC who traveled south to assist crews from other Cooperatives with power restoration after the devastation from Hurricane Irma have arrived home safely. Upon their arrival, the crews sat down with CEO/General Manager Dan Singletary, and discussed some of things they saw, as well as some of the challenges they faced. 8 linemen from HOEC will be traveling south to assist crews from other cooperatives with power restoration after the devastation from Hurricane Irma. 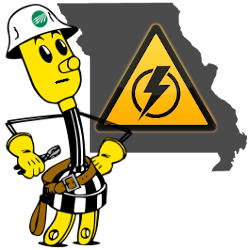 Along with HOEC, other Missouri electric cooperatives are also sending crews. Altogether, 154 linemen from 26 systems in Missouri will be responding to the call for help from electric cooperatives in the path of Hurricane Irma. Dan Singletary, CEO and General Manager of Howell-Oregon Electric Cooperative, along with his wife Rhonda recently coordinated efforts in West Plains to gather supplies to send to Hurricane Harvey victims in Texas. The HOEC business office will be closed on Monday, September 4, 2017, for the Labor Day holiday. As always, dispatchers will be available to serve members in the event of a power outage.